The Indian tribes of the Ohio Valley were surprised and angered by the defeat of their French allies in the French and Indian War; the natives were in possession of their homelands and had little feeling of loss during their association with Frenchmen. When word arrived in the Ohio Valley that the tribes were expected to turn their loyalty to a new European monarch, George III of Britain, they were outraged. English dominance in North America meant the construction of new forts and the movement of new settlers into traditional Indian lands. The earlier French presence had been slight and the relationship often harmonious. British traders lacked the reputation for fairness in dealing with the Indians that had been the hallmark of the French. The natives had become dependent on European firearms, ammunition and other manufactured goods, and were now forced to deal with untrustworthy English partners. British arrogance was well-known among the Indians. The French in many instances had married native women and been adopted by the tribes. Few British followed that example and many expressed utter contempt for the natives' lifeways and worth as human beings. Tensions were further heightened when, in early 1763, Sir Jeffrey Amherst, the new North American governor-general, announced that he would discontinue the practice of presenting annual gifts to the tribes, an event long honored by the French. The Indians were insulted by this snub, but also were angry to be denied the expected tools, blankets, guns and liquor. The resulting widespread unhappiness presented a platform for a native visionary, who was known simply as the Delaware Prophet. He preached ardently for a return to traditional ways and for the rejection of contact with the British. This platform was soon adopted by the then undistinguished Ottawa chieftain, Pontiac (c.1720-1769), who was known primarily for his oratorical skills and as a supporter of the French in the recent war. His message found sympathetic ears among the Delaware, Seneca, Chippewa, Miami, Potawotomi and Huron, among others. The resulting conflict in the Ohio Valley has been labeled Pontiac’s Rebellion or Pontiac’s Conspiracy by non-Indians. The chief held a war council with like-minded tribes in April 1763. A plot to take over Fort Detroit by subterfuge was foiled, but Pontiac led an attack against that installation in May and set up a siege. Later during the summer, a British force attempted to free the fort by launching a surprise attack against Pontiac’s village. The plan was discovered and the attacking British soldiers suffered heavy casualties in the Battle of Bloody Run (July 31, 1763). Pontiac continued his unsuccessful efforts at Detroit into November. To the east, another British bastion, Fort Pitt, was also the target of allied Indians. British relief forces under Colonel Henry Bouquet were en route to the besieged fort when they encountered a large Indian force. The resulting Battle of Bushy Run (August 5-6, 1763) was costly to the British, but they successfully preserved Fort Pitt. Despite these two defeats, the allied tribes were highly successful during much of 1763. 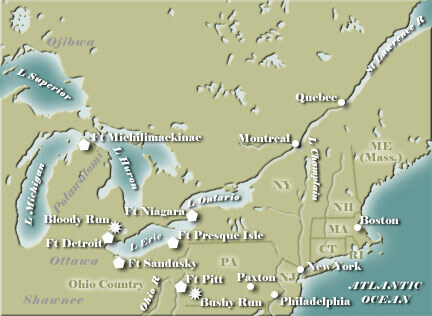 Eight British forts fell, which included major installations at Presque Isle, Sandusky and Michilimackinac. Fort Niagara saw no action during the uprising. Henry Bouquet conducted warfare against the Shawnee and Delaware in western Pennsylvania. His success enabled Sir William Johnson to negotiate a peace arrangement. Colonel John Bradstreet was assigned to the Great Lakes region, where his efforts to conclude treaties with the resident tribes came to nothing. After 1764, Pontiac's influence among the tribes waned rapidly. He made recruiting trips into the South and West, but found few interested parties. In 1766, Johnson managed to conclude a general peace treaty in which Pontiac received a pardon. He lived quietly for several more years before being killed by a fellow Indian. One of the prime results of Pontiac's Rebellion was the decision of British policymakers to issue the Proclamation of 1763, a measure designed to shut down white settlement of the West until organizational reforms could be effected. American reaction to this measure was immediate and heated. It is also important to note that most of the fighting against the Indians during this uprising was conducted by British regulars. The colonial soldiers had performed poorly during the French and Indian War (with a number of exceptions, including Rogers Rangers) and were purposely excluded by British commanders. The terror generated on the frontier by the Indian attacks fostered much bitterness. A number of racial incidents occurred, including the brief appearance of the Paxton Boys in Pennsylvania. See Exploration and Early Development of Pennsylvania.